The second week of February 2015 brought me to the beautiful city of New Orleans for the Mardi Gras Carnival. I checked into a hotel in the heart of the French Quarter and hit the streets with my camera. NOLA is a fine-looking city; the brightly colored, terraced town-houses are adorned with ornate iron-work. Revelers and guests lean lazily on iron banisters above the seething crowds of Bourbon St, tossing purple, gold, and green strings of beads. These charming iron and plaster facades are set against the decidedly modern backdrop of downtown beyond Canal St; skyscrapers that line the Mississippi River lighting up the sultry sky above the carnival. 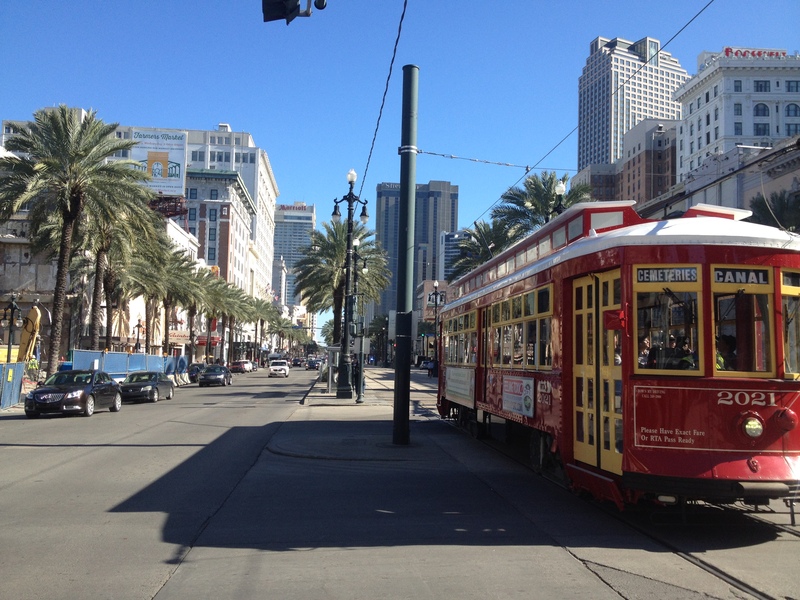 The streets of downtown are inlaid with trolley tracks that provide an easily accessible network of urban public transit—red and yellow trolley-cars that mingle with the busy street traffic. Everywhere there is a permeating smell of Cajun cooking, a rich mixture of beer, bay seasoning, and gumbo spices floats through the air. The public arts scene in New Orleans is primarily focused on performance art. What the city lacks in public visual arts and murals, it makes up for with music, parade, and dance. I spent an evening at a bar called “The Spotted Cat” taking in a set by “The Shotgun Jazz Band”, who played to brass and clarinet-centric jazz style of Louisiana. A couple nights later I made it to The Civic Theatre to see New Orleans natives “Cowboy Mouth” play their distinctive blend of theatrical punk and Cajun-creole music, which included a punk-rock rendition of “Iko Iko”. 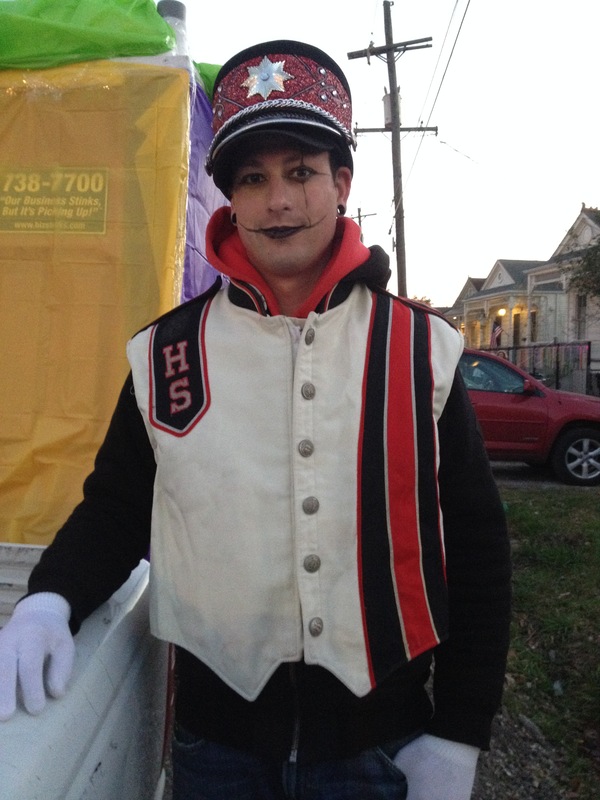 The house-bands and marching bands of the city were talented to a fault, turning out versions of “Oh When the Saints Come Marching In” and “House of the Rising Sun” that seemed to be issuing from every street corner during Mardi Gras. As the holiday weekend approached, I was able to pull myself away from the party for long enough to track down old friend and New Orleans parading queen Katrina Brees. Katrina heads up the legendary Krewe of Kolossos: “An inspiring mobile spectacle transforming trash into a whimsical world of colorful Carnival.” Katrina took me for a tour of her studios at the Bywater Art Lofts where she fabricates custom bike-floats and Mardi Gras costumes from refuse and discarded items. 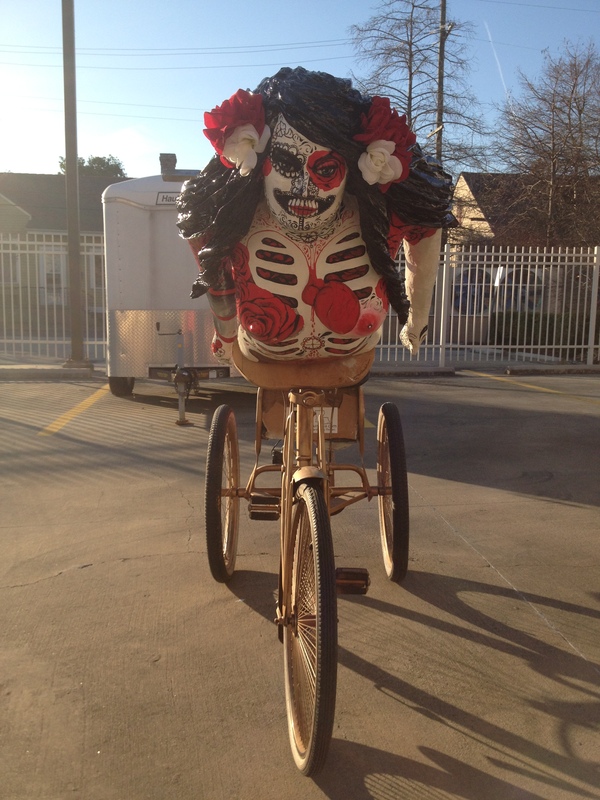 Her creations are stunning: ride-able seahorses, caterpillars, and bulls made from three-wheeled bicycles; sequined and bejeweled costumes for her dancing troupe “The Bearded Oysters”. 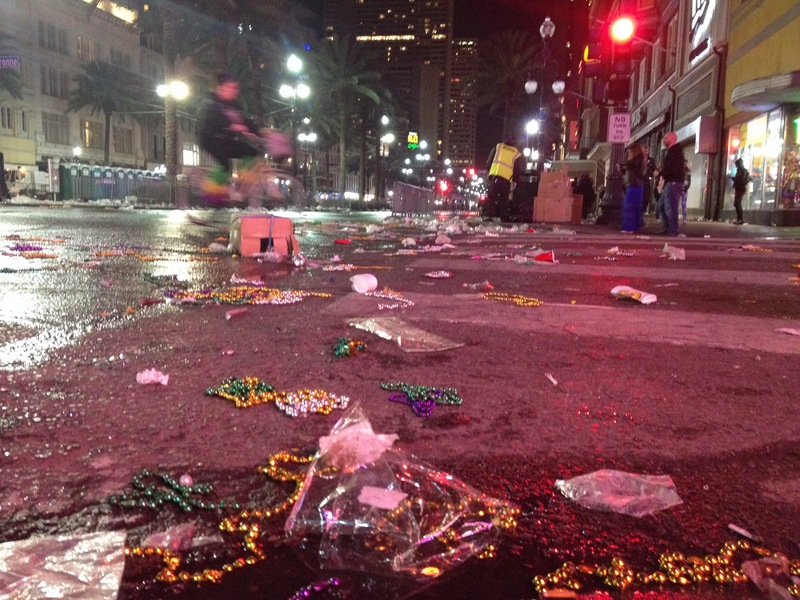 Katrina invited me to march in the next days’ Mardi Gras Parade which was an experience like no other; I have never seen such wild revelers, or streets paved with beads and crushed beer cans. The parade route was five miles long and packed by thousands of screaming revelers; our troupe was flanked by “The Flying Elvi’s”—a group of motor-scooter riding Elvis impersonators. Drinking on the street is legal in NOLA; by the end of the night my shoes were soaked in brew and I was happy to retire to my hotel and take a long shower. 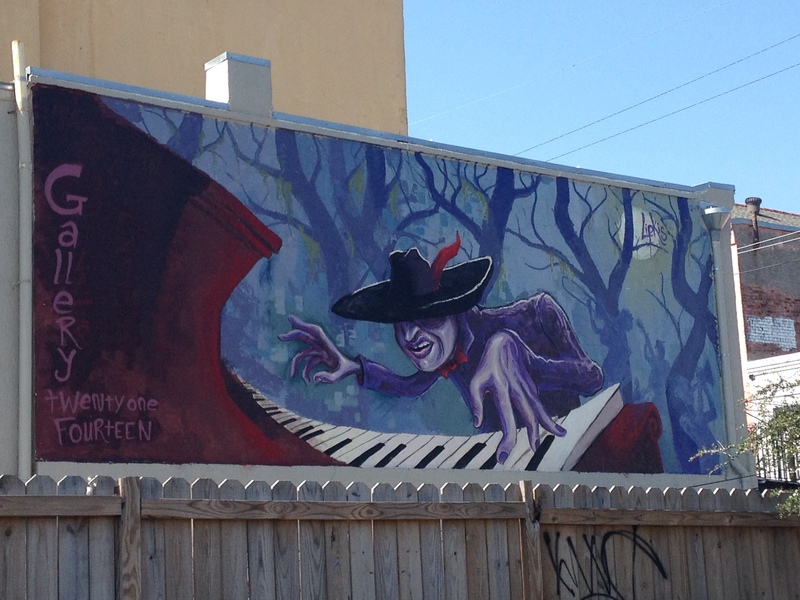 As far as the Graffiti/Mural arts scene of NOLA is concerned, I saw precious few examples of full-blown murals in my travels around the city; they included a several-stories tall painting of a clarinet on the Hyatt, and a Cajun pianist playing amidst a swamp on the side of Gallery Twenty-one Fourteen. Simply put, it seems that all of the arts in this city, even the visual arts, lend themselves to its musical heritage. The graffiti scene doesn’t include very many full-blown colorful pieces or “burners”; rather it’s a very handstyle (tag) and throw-up (bubble-letter)-oriented place. 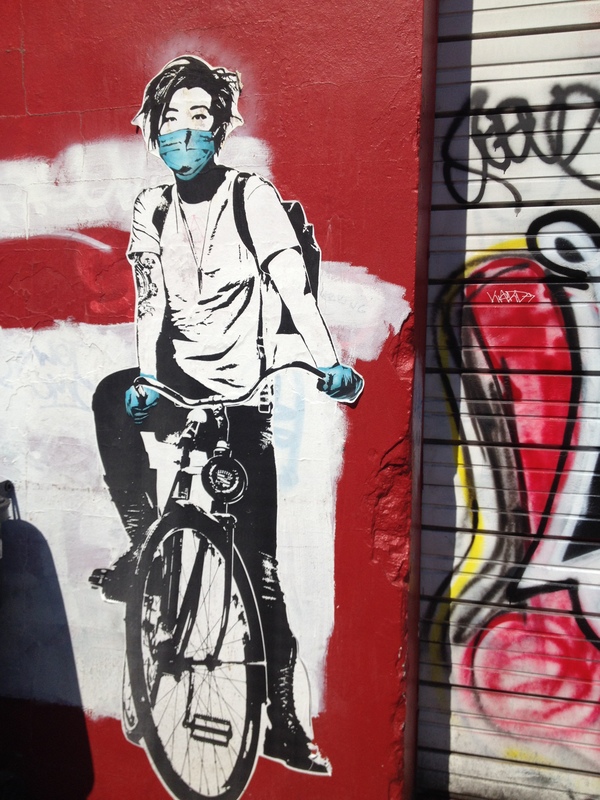 The city is very walkable and accessible by public trolley, so the doorways and alleyways of the city are covered with quickly-executed spray-can and paint-marker handstyles. 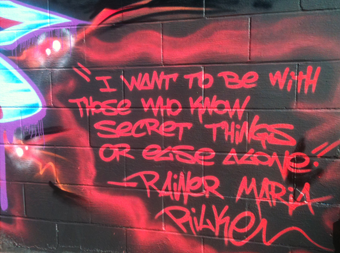 The most prolific of the local writers seem to be Achoo, Realm, Old Crow, and the VRS crew; all of whom focus on covering large swaths of the city with consistent tagging. The most developed and attractive pieces of graffiti in the city roll through on the freight trains that cut through the French Quarter along the Mississippi River carrying pieces by Rust, Saint, Used, and Baltimore legend Jase. I did not get a chance to paint in NOLA while I was there, but there’s always next time. Now I’m headed along the Gulf-coast into Florida, toward Tampa Bay and points south. This entry was posted on February 17, 2015 by dannydiamond117. It was filed under Uncategorized .